Alaska Ships A Capitol Christmas Tree With All Of The Trimmings This year's Capitol Christmas Tree is the first tree to travel partly by boat, in 50-foot waves, from Alaska to Washington, D.C. The tree will be lit on Dec. 2. The Capitol Christmas Tree is unloaded from a truck following its journey from the Chugach National Forest in Alaska to Capitol Hill in Washington, D.C. After it is secured in the ground, the tree will be decorated with thousands of ornaments, handcrafted by children and others from Alaska communities. It started as a little tree, barely the height of an eager toddler hyped up on holiday treats, more than 90 years ago. Now, it's all grown up — 74 feet, to be exact — and has made it to the big leagues: Washington, D.C.
A Christmas tree in the capitol is nothing new. The tradition began in 1964, when then-House Speaker John McCormack, D-Mass., proposed planting a tree on the U.S. Capitol Grounds. The Forest Service took ownership of the project in 1970. 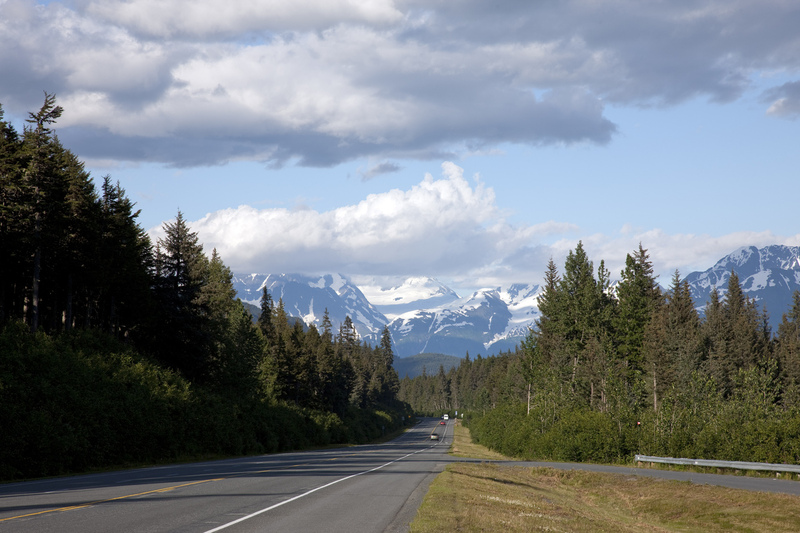 Each year, a tree is cut from a different U.S. state and brought to Washington. The first tree was from Pennsylvania, a popular choice in the early years. But this year, there's a twist: It's the first time that a tree has come from a noncontiguous state, and, according to organizers, the first to travel by boat. It also comes from a forest that's notoriously hard to pronounce. "A kindergarten teacher once said that you say Chugach like it's a sneeze, and I've used that comparison ever since. It's a miracle," says Mona Spargo, who works for the Chugach National Forest in Alaska. In a forest the size of New Hampshire, how do you pick just one tree? This one was actually found 300 feet from a highway — in a national forest that's 99 percent roadless. From the Scenic Seward Highway in the Chugach National Forest, Alaska to the streets of Washington, D.C. — this year's Capitol Christmas Tree made quite a journey. Trees have to pass rigorous requirements before being even remotely considered for the Capitol. The tree will be seen from all sides — so you can't just hide flaws the way you do at home by stowing it in a corner. "It can't have any thin spots or branches that stick out a lot on one side or the other. It has to be a perfect conical shape," Ted Bechtol, superintendent of the Capitol Grounds, wrote in a blog post for the Forest Service. Perfectly conical? Check. Sixty-five to 85 feet high? Check. A uniform spread of branches, good density and rich color? Sold! After three weeks of walking, silviculturist Mandy Villwock narrowed the selection to six. Then Bechtol flew out to help make the final cut. It's his 11th year helping to select the tree. When asked if he has a favorite, he wrote that's like being asked if he has favorite children. Bechtol wasn't overly enthusiastic about any of the trees — until he saw the final contender. "As soon as he saw it, he gave us a huge thumbs up. You could see that this was the one," Spargo says. Bechtol made the decision on the spot, but that was just the beginning. The tree traveled precisely 3,410.94 miles over its two-week trip, a trip that Spargo, who rode along with the tree, says generated unexpected enthusiasm. "We were amazed. I was surprised at how many people had connections to Alaska and just how everyone was so enthused about it," she says. Holiday enthusiasts could track the tree's path and figure out community stops where they could catch a glimpse. "Every bathroom break and every stop for gas became an event in itself — people were following us!" Spargo says. She likened it to being on tour with a celebrity. "I don't know how we will go back to regular life," she says, laughing. 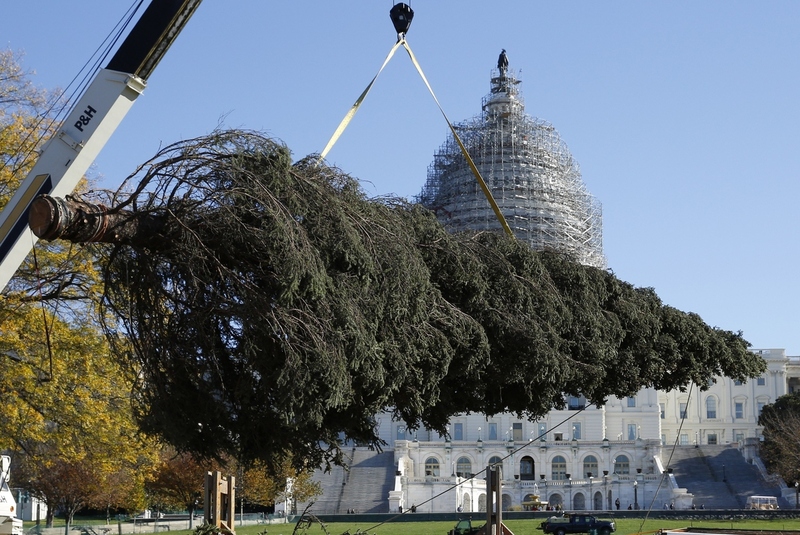 The tree arrived at 4 a.m. on Nov. 20, to avoid traffic, and now sits on the front lawn of the U.S. Capitol Building. But you can still see the complete path — including a jaunt in the Pacific Ocean — online. Safely packed on a container ship, the tree faced stormy conditions during the three-day voyage between the Port of Anchorage in Alaska and Tacoma, Wash.
Organizers say there were 100 mph winds and 50-foot waves to contend with — making the tree, as Jimmy Fallon joked, perhaps the hardest-working member of Congress. Upon arrival in Tacoma, the tree was unloaded onto a flatbed truck and driven across the country by Alaska Trucking Association "Driver of the Year" John Schank. He's driven 5 million miles over the course of his career — and with flushed cheeks and a white beard, he looks remarkably like Santa. According to Bechtol, a crew of seven people is responsible for sprucing up the tree when it arrives, infilling branches and making minor repairs. Then, the tree is lifted by a crane and dropped into a concrete base — grounded with anchors to help keep the tree steady. Bechtol writes that gusts up to 45 mph haven't toppled a tree yet. As the home state, Alaska is responsible for the tree decorations — and its residents didn't disappoint. Artists, children and everyone in between handcrafted 4,000 ornaments for the Capitol tree as well as Christmas trees in federal offices throughout D.C. They also stitched accompanying tree skirts. The tree will be lit by House Speaker Paul Ryan, R-Wis., on Dec. 2. He'll be joined by a special guest: fifth-grader Anna DeVolld from Alaska. She, along with hundreds of other elementary school students, submitted essays to Sen. Lisa Murkowski, R-Alaska, describing why the tree is significant for Alaskans. DeVolld drew parallels between the tinsel sparkling like glaciers and the tree's height mirroring Alaska's colossal mountain peaks. 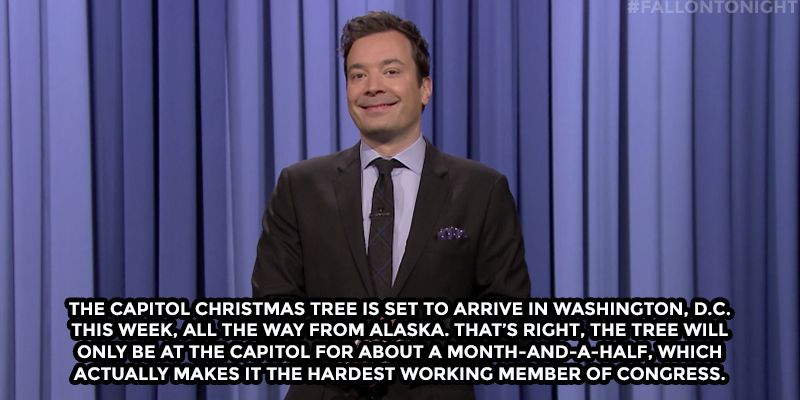 "Alaskan Christmas trees are special because they are a symbol of Alaskan pride," she wrote. An earlier version of this post referred to Chugach as a national park. In fact, it's a national forest.